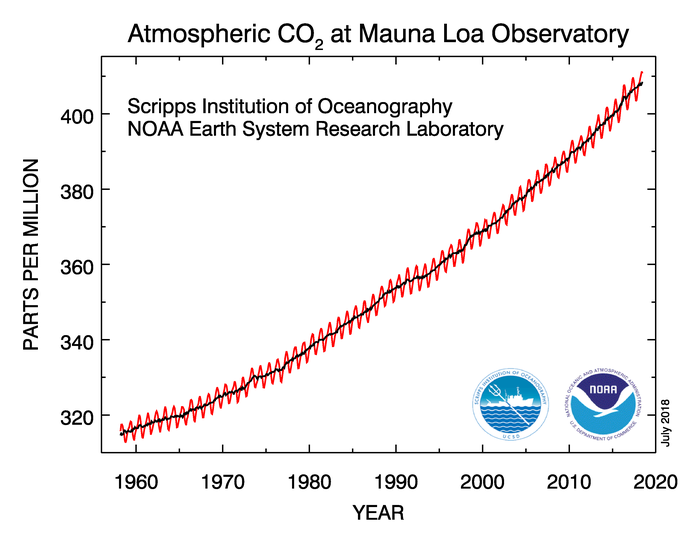 Home / Uncategorized / What are the recent Mauna Loa CO2 measurements? 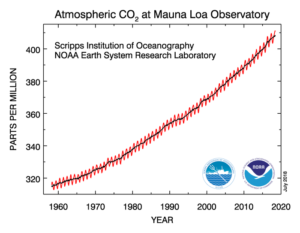 What are the recent Mauna Loa CO2 measurements? From 2016 to 2017, the global CO2 average increased by 2.3 ppm – the sixth consecutive year-over-year increase greater than 2 ppm. Prior to 2012, back-to-back increases of 2 ppm or greater had occurred only twice. The Mauna Loa observatory is ideally located for monitoring CO2 and other greenhouse gases in the atmosphere. Situated at more than 11,000 feet above sea level in the middle of the Pacific Ocean, the site gives researchers the opportunity to sample air that has been well-mixed during its passage across the Pacific and, thanks to its altitude, is minimally influenced by local vegetation or local pollution sources. 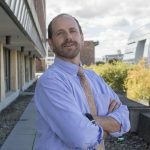 The article links directly to CO2 data sets and other resources. The Calculus Projects page here has a Mauna Loa CO2 project and the Misc Materials page has the CO2 movie. Previous How many people are there and how many can the earth support? Next How does the U.S. use its land?